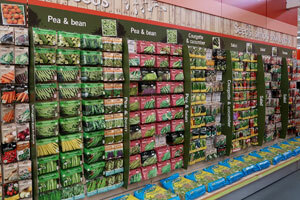 Haskins Garden Centres have launched a completely new seed layout this autumn to attract new customers and make it easier to shop. Lisa Looker, brand director at Haskins Garden Centres, commented: “Previously seeds were displayed by supplier, which meant that customers might find tomatoes in three or four different places. The new layout is arranged by product type, so the customer can easily find the seeds they want then choose between different brands and different varieties. We saw this done successfully in France, and have been trying to find a way to do this with our own range.